"Life is like a box of chocolates - you never know what you're going to get. " This morning I made a cheese and chocolate omelet for Eve and I. Sounds a little out there I know, but, I've been missing my morning pan de chocolates. Eve thought it sounded pretty darn weird, in that rolling eyes teenager way. No matter, after one taste she changed her opinion. As we headed out the door to the carpool drop off location I realized I had somehow gotten chocolate all over my face. Then I remembered the photo pictured above, take by my grandfather. When my family first moved to California we lived in Van Nuys, Arcadia and then moved to our own home in Encino. On the back of the photo it says Van Nuys 1966, which would mean I was four years old at the time. Turns out that chocolate, like myself, are native to South America. Yesterday Greg has an old friend over for a visit, Roger. Roger and Greg met as children in Arcadia. Turns out Roger attended the same elementary school as I did, Holly Avenue in Arcadia. He is my brothers age which means they were school mates. What a small world, a six degrees of separation, "Lost" moment. I ended up flunking first grade because I didn't understand or speak english, however, I did win the all school illustrated book competition. Language is no barrier when it comes to the art spirit. Speaking of the art spirit, I am working on a chocolate perfume. 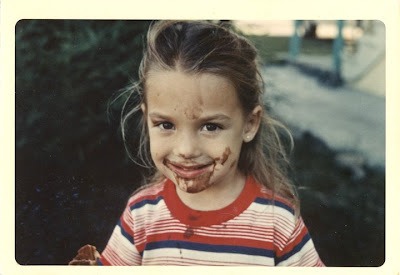 You are so cute, even with that chocolate covered face! Hi Liz, thank you, that chocolate is from an ice cream cone. Shall I call you Nik or Dimitris? Wow, your from Labdanum country, that is one of my all time favorite ingredients. Lucky you!